The Crawley Irish Festival 2011 programme design has been revelaed, pick one up on Sunday 28 August 2011 at Southgate Playing Fields from Noon. Returning two years after her last visit to Chequer Mead, Irish songstress Cara Dillon will preform on Friday 8 April 2011. Photos from the 2011 Crawley Saint Patrick’s Parade – Event Photography by PicxSell.com and Celtic & Irish Cultural Society Contributors. The Celtic and Irish Cultural Society extend their congratulations to Crawley Town Football Club for reaching the 5th Round of the FA Cup. 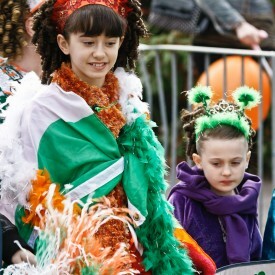 Crawley’s 8th annual Saint Patrick’s Parade takes place on the first Sunday after Saint Patrick’s Day. 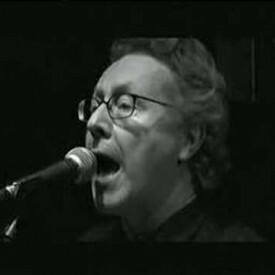 Crawley will celebrate Ireland’s national day throughout the weekend. Crawley Irish Festival 2010 Video – dancing from local Irish dancers with backing from Dun the Veil in front of the Dome Stage. 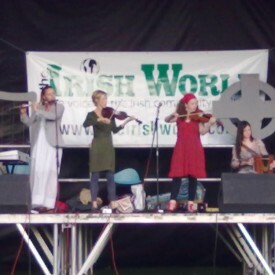 Photos from the 2010 Crawley Irish Festival made possible by support from Crawley Borough Council, West Sussex County Council and the Emmigrant Support Fund. 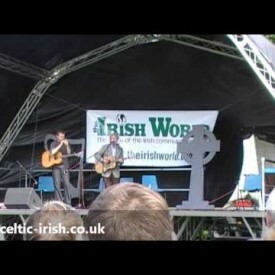 Sean Cannon, of the Dubliners, performs with his son, Robert, on the Trad Stage at the 15th Annual Crawley Irish Festival.